I went out this afternoon with a friend to scout for bait and fish. After catching about 40 8 to 10 inch Gizzards we started looking for Stripers. The wind was blowing out of the East so I did not expect to see very large schools today. We looked and fished for a couple hours finding schools like the one on the picture above. 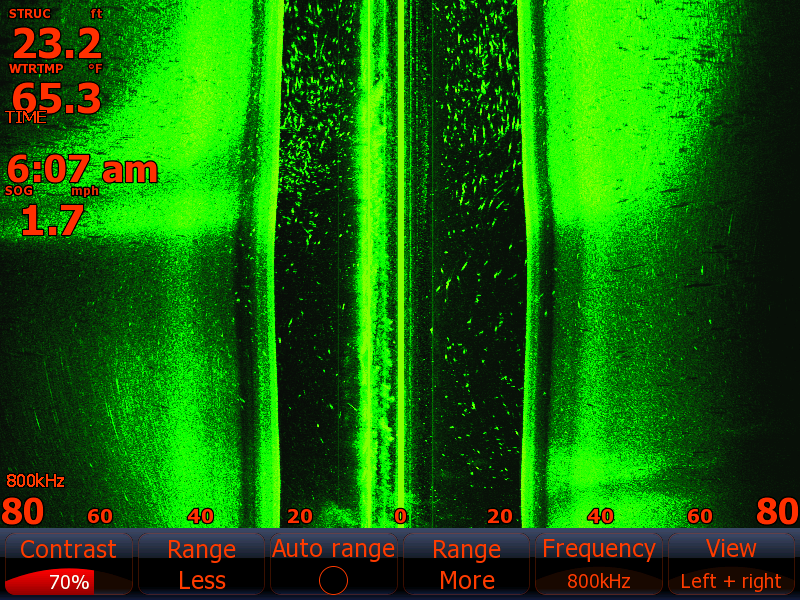 The sonar screen on the left shows a small school only about 10 yards wide with the fish stacked up pretty tight. When I see this configuration of fish the Stripers are generally not feeding. The Stripers were very tight to each other and there was no streaking which would indicate the fish were not feeding. The upper line on the sonar is my sinker and the line just below it rising up to the sinker is my Gizzard getting chased by the Striper that can be seen streaking up chasing the bait which did hook up and eventually boated. The fish was a smaller 5 pound Striper and notice only one fish was interested. The right screen is Structure Scan set on Side Scan in a 80 foot range. The boat is at 0 and we can see the size of the school and actually how tight it was. The school was only about 100 feet wide by 10 yards long with maybe a couple hundred fish mixed into the group. We boated only 2 fish out of this particular school, again the fish were pretty lethargic at the time this picture was taken. The fish would only hit the downlines that I had set at 24 feet deep, [The big Gizz had swam up to avoid the school of fish]. The Stripers would not engage my freelines that I had out on a dozen boards. If the school was broken up more and numerous fish could have been seen on the Lowrance my boards would have also hooked up. We caught our limits easily and got home in time to climb up in a stand for the evening. Cloudy, Cold, Wind, Cold front conditions, Water temperature dropping to 62*and Clear. I would have postponed today's trip but this trip was scheduled about a month ago when a hurricane blew into the state and this would be the only day they could get everyone together to go fishing. I told Len's son Mark yesterday that fishing could not be any more challenging than fishing today with a major cold front blowing through last night dropping the air temperatures 25*, high winds and the lake turning over. Mark thought it would be a great day to learn the ropes on locating bait and Stripers and cracking the code on how to put fish in the boat in less than desirable conditions. We hit the water at 5:30 and went to where I caught bait the last couple of days but after an hour of looking never saw a piece of bait. The cold front had worked its magic and dissolved the acres of bait I had been working into thin air. We picked up the rest of the crew at the marina even though I warned them of the frigid day and poor expectations for bait collection and fishing. After burning 3/4 of a tank of gas and 5 hours later we finally located enough bait to get started fishing. I had been looking for fish as well as bait for hours and set up nearby where I had seen fish a few hours before. We had pulled an area for about 250 yards when I saw a school of fish off the right side of my side scan so I turned the boat hard right and chaos erupted. Eight people on the boat with boards and downlines hooked up on their first experience with this type of fishing was needless to say interesting. I might as well been speaking Russian when I asked them to hold their rods up high, follow the fish, avoid the other lines or to give them any assistance in boating the Stripers. They had been so cold and patient with me trying to catch bait they were ready to warm up reeling in the fish. After the first round I had to retie and rebait most of the rods resulting in loosing the school. We worked an area of about 400 acres never finding the school or even picking up a single. A couple hours had gone by, I only had a few smaller baits left in the tank, my baits on the hooks were tired, I wanted to catch fresh baits and suddenly I ran over a school of big Gizzards so I had everyone reel in the lines, throw away the baits , got my net ready went back over the school and caught 35 in one cast. Now I was feeling better although my shoulder was killing me from throwing the net so many times today. I got on my big motor and found an area where I felt we could put a few fish in the cooler. I set up my spread again of 8 boards, a bobber and 8 downlines and trolled around popping a fish here and there. I glanced at my side scan and saw about 20 Stripers 80 feet out to the side of the boat so I made a gradual turn in their direction. Within the next 10 minutes everything we had out had been hit, Stripers were hooked up going every direction, some coming in the boat some tangling up with other lines. Once everyone stopped screaming with joy one gentleman spoke up and said "My wife need to use the rest room"! 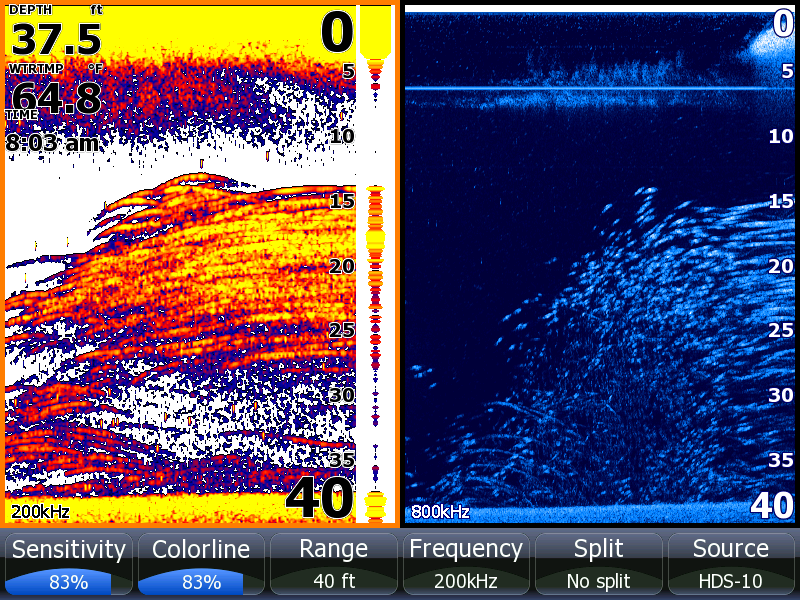 My heart sank as I looked at the Lowrance with fish everywhere. I had struggled all day to put a fish in the boat but it was getting late and when nature calls their isn't much you can do. We reeled in all the lines and headed for the marina. Although I was disappointed in leaving feeding fish on a day that I knew would be difficult the smiles on everyone faces especially Len's made all my pains and labors of the day seem worthwhile. Patience, perseverance, confidence and Lowrance gave a group of people memories that will last forever. Anthony and myself went out yesterday morning looking to catch some big Gizzards to use as bait today. Anthony was going to give me a break throwing the net so I got behind the wheel and searched for areas that were holding bait. The bottom green screen was taken off of an HDS-10 which was programmed to side scan on an 80 foot scale [the 20, 40, 60 and 80 on the scale represents feet out to the right and left side of the boat, we are looking at a total of 160 wide area]. We were in 23 feet of water and came upon a broken up school of bait. The boat is currently at the top of the picture in the 0 range, we are looking at scattered bait [small dashes] increasingly getting denser as we travel forward [The screen travels top to bottom, the further down the page you look the further behind the boat the picture shows]. I had Anthony throw the net when I took this picture resulting in catching about a dozen 8 to 10 inch Gizzards. The middle screen is showing 3 different screens, the right screen is down scan, the middle screen is regular sonar and the left screen in bottom lock which is showing the bottom 10 feet of water zoomed in 3x, the other 2 screens are set to a scale of 0 to 40 feet deep. 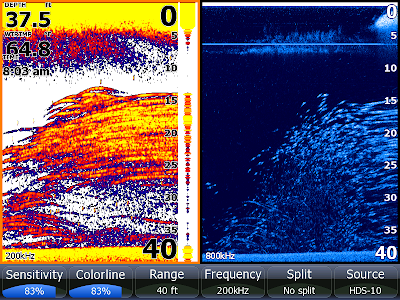 On this screen you see clearly on down scan 4 or 5 Stripers located about 30 feet deep attacking the Gizzards on the edge of the school of bait [Stripers are the longer streaks]. The middle part of the screen shows the Stripers again as longer arches and the left screen is zoomed in on the whole mess. The upper screen picture shows 2 screens, the left screen is traditional sonar and the right screen is Structure Scan set on Down scan. These screens move right to left, history is moving to the left. It is clear to see that we are on a school of Big Gizzards with a few Stripers on the lower left edge of the school. I was slowing down as I took the picture so the Gizz are showing up as smaller dashes on the down scan at about 4 mph and when the boat gets to about 1 mph they start to arch toward the top right of the page nearer to the transducer because the boat has slowed down to the point where the bait stays in the picture longer. If I were running at a speed of 30 mph the school would show up as a large cloud of bait packed so tight you would not be able to see any individual baits beside the school. Needless to say we caught plenty of Gizzards this morning which resulted in a cooler full of fish after a couple hours of fishing. I got out early this morning and caught 40 baits, picked up the guys at their dock and went fishing. I intended to put out my spread of a dozen boards and a couple free lines before I got to the flat that I expected Stripers to be holding but we started getting jammed after getting only a few baits out. For the next couple of hours we did battle with the Stripers till we ran out of baits. We got all of our rods in and took off to catch more bait. After about 20 minutes of looking I found what I wanted and filled the tank up. It was still early in the morning so I decided to look around to see if I could located any schools. I set up putting out 10 boards and 8 downlines rigged with beautiful fresh bait. I pointed my boat uplake, set my speed and turned on my auto-pilot because it was very little wind and no boats out. By lunch time and eighteen Stripers later we called it quits, took a picture and took them back to their dock. 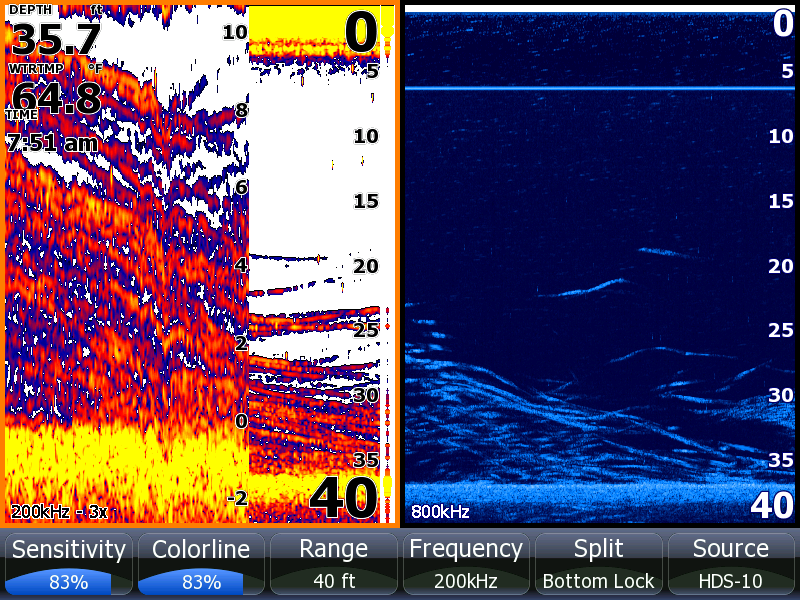 The picture of the Lowrance is a school of Stripers I located a couple days ago around the power plant. Sunny and Pleasant, Water Temperature 68* and Clear. I picked the guys up at the marina at 6:30 and we went to catch bait. I was very concerned this morning about the bait collection and fishing conditions after the last 2 days of major winds and a cold front blowing through. Bait was tough but we caught plenty and set our spread out of a bunch of boards and downlines. We had pulled a stretch for about a half a mile when I noticed one Striper blow up across the lake. After a couple minutes a gull flew over to the same area so I headed that direction. About 200 yards before getting there I started showing Strippers on my Lowrance. We had our downlines in there faces but we were not taking hits. Next thing we knew a board went off and before we could net it 6 or 7 other rods bent over. Needless to say we were quite active for a brief time. After tying a few lines and rebaiting we hit the area again with no success. We fished the rest of the day without putting another fish in the boat. The lake should settle back down in a couple days and I will start working on them again. Cloudy, Rain and Warm, Water Temperature 72* and Clear. Cloudy and warm, Water Temperature 71* and Clear. Picked the guys up early and caught bait. We set out a spread of boards and a couple downlines and the boards started going off. The first fish we hooked into was a pig. Joe jumped on the rod and battled the fish while it pulled drag. Once he got it to the boat it went under the boat and motor and out the other side. He could not gain on it and it finally got into a downline. Dave thought he had a fish on so he snatched the rod up and, well you guessed it, broke the fish off. Before the guys could realize what had happened other boards started going down. We went through 2 hours of action then had to go catch more bait. After catching bait I made a major move and as I was running I spotted what I thought to be a large school of Stripers. I slammed on the breaks and told the guys to get the downlines out as quick as we could. My interpretation of the Lowrance was true, we pulled up into the school of fish that you see above on the bottom picture. 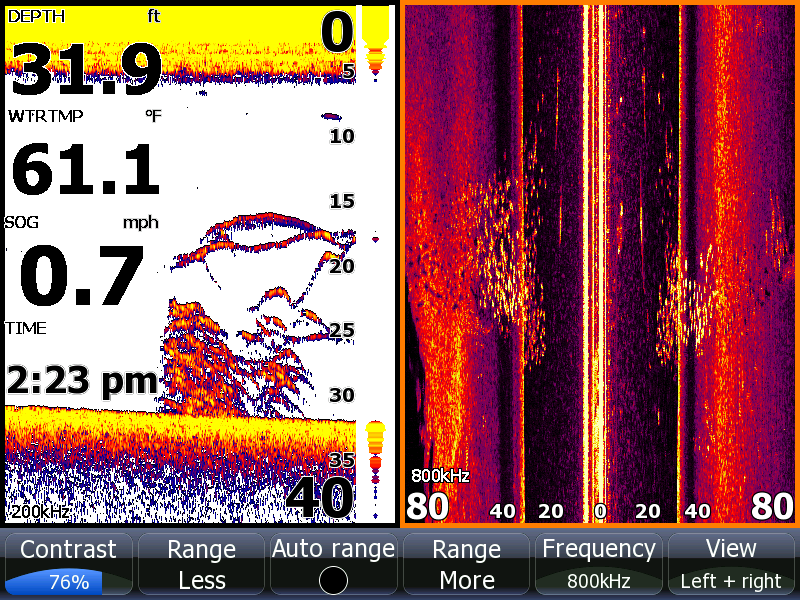 The left screen is on bottom lock, the middle screen is traditional sonar and the right screen is side scan with each dash representing a Striper. Needless to say we had our hands full for a while. About an hour later I took a picture of the Lowrance on yet another school of fish, this time the left screen was side scan and the right screen was on down scan. There were not thousands of Stripers in this second school but enough to keep us busy. Joe is pictured holding a citation Channel Cat that weighed in at 14 pounds which he released alive and well. We had well over 30 hook ups today and kept our limit of Stripers for the table. Picked the guys up at 6 then went to catch bait. Every morning lately it has taken about an hour or so for the bait to get balled up enough to catch so we worked on bait collection for awhile then set up on an area that I knew was holding some nice Stripers. We worked the area for about 2 hours until we ran out of baits then caught 40 more baits and went to another area. I saw plenty of fish there but for some reason they were not real aggressive. After working the area for an hour I decided to make a move but after reeling in the first bait we started taking hit after hit. After hooking up with over 20 Stripers it got hot out and the guys were ready to go. The end to some beautiful weather is on its way, rain is coming for a couple of days this week. Sunny and Beautiful, Water Temperature 70* and Clear. Maury contacted me a few weeks ago excited about setting up a fishing trip for his 25th annual family fishing vacation at Lake Anna. He had told me that although they had been coming to the lake for so many years on these fishing vacations they had never caught any fish and that he was ready to break the curse. I picked him up with 4 sons and a Grandson and off we went to catch bait. It was extreemly foggy this morning until about 8:30 which made bait collection a little difficult. I was in no hurry to set up fishing because I wanted to fish on the main lake but with a Bass tournament today I did not want to put my clients in harms way. [ Bass Boaters use their GPS to navigate in the fog driving at speeds up to 70 mph not giving themselves much chance to avoid a collision with another boat.]. Once the fog lifted we had caught plenty of bait so we put out our spread and fished. We popped a couple of Stripers and right when we got on a school 2 Tow Boats had to run right next to us spooking the fish. Michael was ready to go back to the dock to get some more Beers so we had a pit stop, dropped off a couple fish for the girls to clean and went to top off our bait tank. The picture of the Lowrance depics a major school of baits that I threw into. I barely could lift the net over the side of the boat due to how full the net was. We set up on another area nearby and took about 8 or 10 quick hits before the boat traffic ran us off. Maury wanted to let some of the other family fish so we hit the dock again, traded some fisherman and went to another area. We fished there till everyone caught a fish then they were ready to call it a day. We all had a great time today and I don't think I have ever seen a family get along with each other as well as this family does. It is a good feeling to see families regularly make time to reunite every year to enjoy each other before heading back to their lifestyles. Today we kept 10 nice Stripers to feed the family tonight. What a beautiful weekend for the Cralle's. Gus [the man holding the pole on the right side of the picture] is a Marine. Sunny and Beautiful Weather, Water Temperature 71* and Clear. I picked the guys up this morning around 5:30 and went to catch bait. We put out our spread and our baits immediately started getting chased to the surface with Stripers boiling under them. We worked the area for quite some time taking occasional hits but never had numerous rods go off at once. Although fishing was slow today we all had fun and certainly enjoyed the weather. The guys were anxious to get off the water today because they were interested in meeting some Russian for dinner this afternoon. They kept 7 Stripers to take home for the freezer.